The GP practices in Stockport utilise the EMIS GP system. The EMIS EPR Viewer provides a ‘read only’ view of shared records held in EMIS Web as a standalone system. 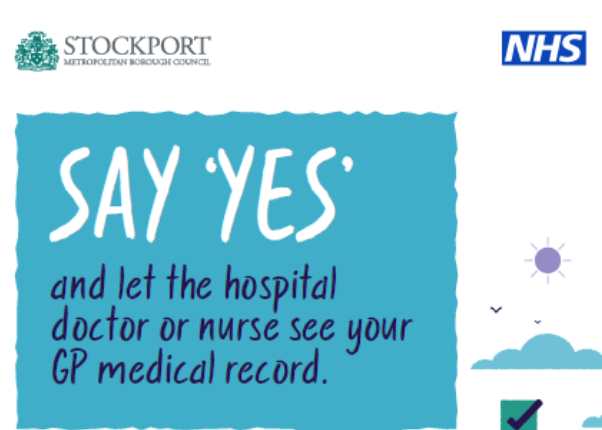 Clinicians in the Emergency Department at Stepping Hill hospital are now able to view a consenting patient’s full GP record where it is necessary to provide and support the treatment and care to that patient. Other initiatives nationally enable partial access to the GP record but this enables full access to the patient’s GP record. Enables clinicians to provide better more informed care to patients. It provides an environment in which safer care can be delivered which drives better outcomes for patients. Significantly increased confidence in delivery of care by clinicians and medical professionals. Allows for identification of current patient medications and allergies, reduces unnecessary emergency admissions and avoids duplicate tests. Improvements in diagnosis times expedites patient care, improves the patient flow and reduces service costs as clinicians and patients do not have to wait for the information to arrive by other means. Most importantly it provides assurance to patients that medical professionals know and understand their current and past medical conditions and can make the right decision at the right time about their treatment and care. The legislative landscape with regards information sharing is one that is complex and privacy is an emotive subject close to many peoples’ hearts. Do not underestimate the amount of work and effort that is required to get stakeholders on board with a journey such as this. Although the benefits to individuals are clear the key to success is to evidence the considerations and due diligence about the security and privacy obligations. Engaging key stakeholders as early as possible in the project is important especially those who are data controllers with nervousness about sharing the information they are responsible for. The benefits to the sharing of GP data in this way are vast. The individuals that came together working as a team from lots of different organisations on this unique sharing initiative worked tirelessly to reach the final outcome. They made the project a true success and placed patients in Stockport in a much more beneficial position in relation being delivered better emergency care outcomes.